Rodrigo De Paul celebrating his goal for Udinese. 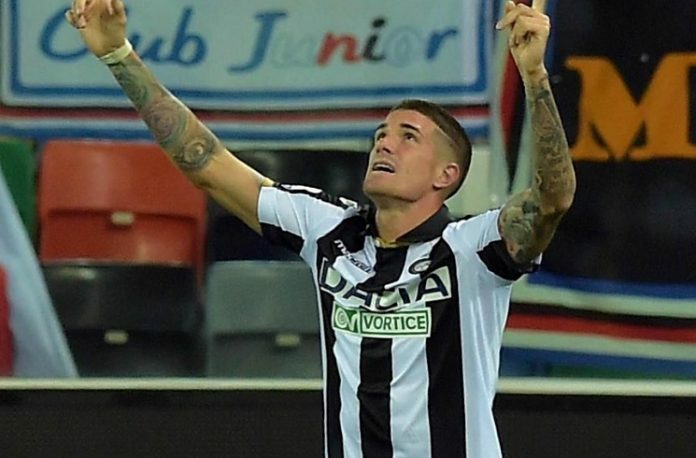 Rodrigo DE PAUL scored for Udinese in their 1-1 draw against Torino in Serie A. The former Racing Club and Valencia man scored his third goal of the season (in five matches) for Udinese. In comparison, last season he finished with four goals in 39 matches and the year before that once more with four goals but in 35 matches. A shot from outside of the penalty area gave Udinese the lead in the first half before Soualiho MEITE equalized for Torino. Ignacio PUSSETTO, preivously of Atletico de Rafaela and Huracan also started the match for Udinese and had the assist on DE PAUL’s goal. Glad to see that Depaul is continuing his excellent form from last year, he deserves a call up for sure. Also glad that Pussetto is starting to acclimatize to Seria A because he was so damn impressive in the primera last season. J.Correa actually came on for Lazio and showed initiative and I’m hoping he can realize his potential. Hey Gonzalo what do you think of Solari (Racing), Miranda (Defensa) and Alexis MacAllister (Arg Jrs)? Lots of midfield talent in the primera and I’m noticing more and more every day. Alexis in particular is only 19yrs old but he is truly impressive, he passes like a 10 and defends like a 5! I really hope he continues to develop. 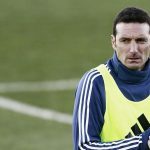 How is Santiago Caseres’ fitness record in the primera? Was he injury prone? Mamoun, I’ve already mentionet MacAllister few times here. The last just 2 days ago. Seeing his maturity and physical appearance it’s hard to believ he is still just 19. If he was born few days later he could have play now for our U-20 team. In this age he is real leader of Argentinos. One of best players of league so far in this season. About Miranda I posted few weeks ago as well. Absolutely player to watch. He was one of the best (if not best) previous season when it’s going to passing accuracy. Solari – RIver product – who once won Copa Libertadores U-20 with the club – always reminded me Lucho Gonzalez. But finally he was adapted to play RM and few times he impressed me so much to even think about him as possible NT material. Sorry Gonzalo I must’ve missed your comments before. All 3 are impressive with Solari being very attacking while Miranda being a beast at defending but MacAllister seems to be great at both. My personal belief is that a player needs to play consistently well for an entire season (e.g. Dominguez, Abecasis, Barboza and Angeleri) in Argentina or europe before deserving a call up for the NT but since Palacios get an early chance, which has thus far proven fruitful, then maybe MacAllister, Solari or Miranda could get a call up as well. Solari is a Palacios/Celso type box to box while Allister and Miranda play as registas, a position that Argentina only has Paredes for. Although this clip is very short but it summarizes all the football qualities of Santiago Ascacibar. Worth watching! Ascaibar was good today but he could have done better to intercept and stop the attack which led to first goal. Ascacibar had a really good game, one of the best players of stuttgart along with insua and gomez. 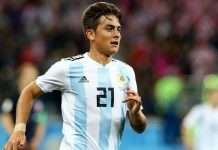 The kid is an amazing talent with lots of grit, a player that Argentina was missing for quite a long time. He has all the prospects to be the best in the world in his position, he almost scored a stunner from oitsise the box. He is one of the many young Argentines that i like a lot! I am excited with our youngsters and personally i would like Scalloni to be our permanent coach. On another note, Manchester united which i always disliked, are chasing both Dybala and Icardi. I wouldn’t like seeing them there. ManU might just get Dybala and he doesn’t look too happy where he is. Everybody in Juve is playing for her highness and she finally scored today, two easy goals and missed even easier 2. I’d rather see him leave and be appreciate somewhere else instead of sitting on the bench or work for her to take all the glory! Stuttgart had an ugly first half. 2nd half was much better after they moved Nico Gonzalez on the flank. Nico didn’t do much tho. Not sure where de paul would fit in National Team.. In either midfield flanks in a 4-4-2 set up he’d fit quite well. He’s physical, skilled and is a great crosser, which would benefit Icardi quite abit. 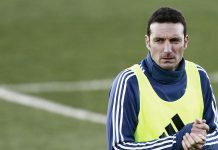 i think there is going to be too much competition in midfield..we have Pereyra as well..
Hope Scaloni and team stays for some more time..
Pussetto had started as well and had very good performance on right wing (assist). Insua, Ascacibar, Gonzalez all in starting line up of Stuttgart. All left positive impressions. Insua goal and assist.